One of my kids reminded me today that we'll need to wish a "Happy Christmas" rather than a "Merry Christmas" when we talk to our British relatives. Nice that a 4 year old notices these sorts of things. Growing up, we'd listen to the Queen's message on Christmas Day. My kids might grow up watching that message on the new Royal Channel on YouTube. Perhaps. I included the dates to emphasize how long Google has known about the problem. They've actually known since 2005. Influential search engine industry veteran Danny Sullivan wrote a scathing article, Google AdSense For Domains Program Overdue For Reform, in 2005. He didn't use the term "distribution fraud" in that article, but that's what he was referring to. I learned of the very apropos term, distribution fraud, from this blog. So, fetch that mirror Google. How are you going to answer the Davos Question? You can’t help but smile at certain comments by Google, home to the veritable oceans of Phd scholars in computer science research and highly skilled software engineers... Imagine the sophisticated the technology needed to split out direct navigation sites! I hope for actual transparency in 2008 and the elimination of AdWords distribution fraud. Practice what you preach, Google. Please. With collective authoring sites like Wikipedia and individual authoring sites like Squidoo, what's the value add of Google Knol? How does the creation of Google Knol help Google pursue its mission (despite already failing at that mission) to organize the world's information? If that information already exists on sites like Wikipedia and Squidoo and on blogs and any kind of web page, for that matter, what's the real point of Google Knol? Inevitably, a new service like Google Knol will lead to more duplicate content. Does Google really think webmasters will trust Google to NOT favor its own content? Think about that in light of the first sentence in the above quote from Google. Is Google Knol a Squidoo Copycat? Danny Sullivan (Wikipedia | Squidoo): Google Knol: Competitors Respond & Time To Limit The Aggregators? Will Google, indeed, have second thoughts about actually launching Google Knol? Or, is there a compelling need for the new service? Are you affiliated with Apogee Search Engine Marketing in Austin? If not, it's confusing as I've always associated your blog and your site with search engine marketing in the past. Apogee Search was recently quoted in a Wired blog regarding PayPerPost. I want to make sure my company is not associated with PayPerPost. I'm not a big fan of that concept. Apogee Web Consulting was mentioned in a Wired blog about the presidential election and Google AdWords. If you're looking for Apogee Search of Texas, here's their blog. They are a Google AdWords Qualified Company. Here's their logo. They've failed at fighting spam. They need to own sufficient content in order to keep their search index spam free. They've decided to compete directly with web content creators. No company will trust Google going forward. As a GOOG shareholder, I'm frankly a little disappointed today. I think the announcement of Google Knol (whether or not it actually sees the light of day) indicates either incompetence or arrogance on Google's part. Either the algorithm is broken and they can't fix it or they've decided that the existing content on the web is not sufficient for their search index. If the former, then Google will lose market share as users lose trust in the quality of the search results. If the latter, Google will lose market share as companies perceive Google as an enemy instead of an ally and work together to circumvent the search engine. Do you see how either case indicates a serious problem for Google? Is this an inflection point in the history of Google? This one really blows me away. Everyone has noticed recently (over the past few years and in particular lately) how dominant Wikipedia is in Google results. Well, I guess Google's noticed too, and decided it wants to own the second click, as well as the first. Google Knol: A Step Too Far? Google’s Death Knol For Some? BTW, does the Google Knol project even fit the parameters of the stated Google mission? Google AdWords is a very simple idea that’s surprisingly little understood. 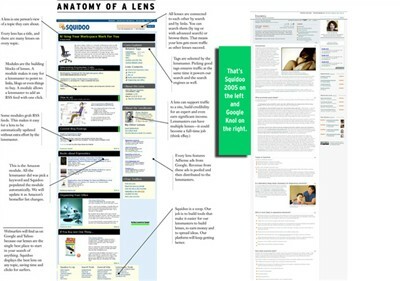 On every page of Google search results, in your Gmail and your Froogle results, and more and more on the pages of other Web sites (like Squidoo or the New York Times), you’ll find these ads. The AdWords are smart. They appear based on the context of what you’re doing. Is he talking about AdWords or AdSense? Both, actually. It's not so much that AdWords are smart. AdSense for Content (which is not the same as AdSense for Search which, in turn, is not the same as AdSense for Domains) is smart, in the sense that it uses contextual targeting. The primary reason, however, that AdSense (not AdWords) appears so smart is that a large inventory of keyword ads exist in the AdWords system which AdSense can use on other sites. 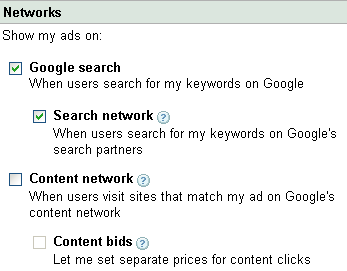 Trouble is, many AdWords advertisers think they're buying only search advertising when they sign up for AdWords. They're actually buying three kinds of advertising, if they don't override the defaults. They're buying search advertising AND contextual advertising AND domain advertising. To avoid confusion (if that's possible), I'm limiting the scope of this post to keyword-targeted ads and am ignoring site-targeted ads. Perhaps it will help to think of Google's advertising system in terms of ad creation and ad distribution. For the most part, AdWords involves ad creation while AdSense represents ad distribution. Ads on Google are the exception. Those *are* AdWords. Taking liberty with Seth Godin's Meatball Sundae idea, I think the meatball is AdWords. All the flavors of AdSense are the toppings. 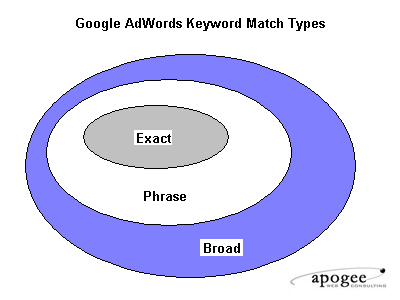 The AdWords system I started using in 2002 was simple. Then they added the content network (AdSense for Content) and changed broad match to expanded broad match and started distributing domain advertising (AdSense for Domains) on BOTH the search network AND the content network. IOW, they kept piling on all this stuff to the core product. I think their goal was to simplify ad management. Advertisers would create a single ad that would run in many places. Advertisers didn't need to understand the differences between search advertising, contextual advertising and domain advertising. They'd simply get more clicks. Turns out, though, that advertisers want more control. They value high quality traffic over a high quantity of traffic. So, Google started to unwind some of the changes they'd made, which made the system more confusing. 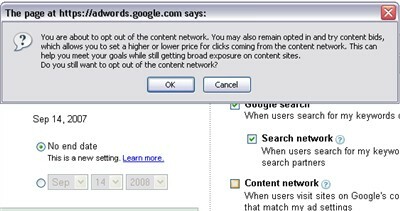 You really do want to opt out of the content network, at least for a search advertising campaign. As noted above, even Google recognizes this is the right thing to do. Unfortunately, even opting out of the content network, you still might pay for some contextual ads. What do I mean? Remember this whole Meatball Sundae idea? Well, since Google threw the AdSense for Domains toppings on, they kind of got stuck in the search advertising meatball. You can't separate them. Unfortunately, this poor implementation leads to this kind of click fraud. Aaron Wall laments that Google "has some of the dirtiest domain traffic partners (many cybersquatters)" on its ad network. Sadly, he's absolutely right. Make sure you know how to block unwanted domain traffic. Don't get me wrong. I'd like to buy domain advertising. I just want to keep it separate from search advertising and contextual advertising. I'd also like some transparency as to where my domain ads would be displayed. PPC advertisers need to recognize that domain ads are about quality traffic and not quality sites. Many turn their noses up (I know I used to) at parked domains since they are undeveloped sites. But, think about it - what's Google? It's an ugly site with some good links and delivers high quality traffic. You don't want people to stick around. You want them to leave Google and go to the external sites. The problem is that PPC advertisers tend to think of parked domains in the context of contextual advertising. Implemented properly, parked domain advertising should be more akin to search advertising. I'm going off on a tangent, here, so I'll save these ideas for a future post. In the meantime, visit blogs like Seven Mile, Conceptualist, Domain Tools, Whizzbang, and you'll see what I'm referring to. Pretty funny. Burger Queen?! 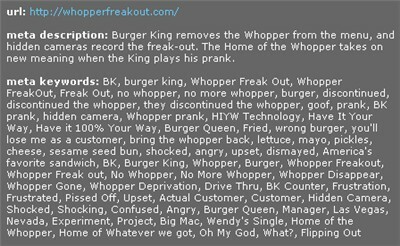 Clearly, Burger King realizes that meta keywords are a joke. Nice to see this sort of SEO humor. I wonder if this was done in-house or if they have an outside SEO/M firm. Well done (pun intended). More evidence of the Google dichotomy. In an attempt to limit search engine spam, Google's going after sites that sell paid links. At the same time, Google is accepting spam in its own paid links, AdWords. What's wrong with this picture? 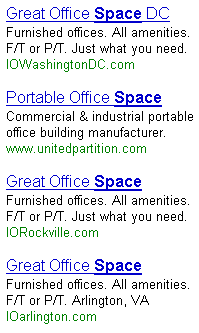 On a somewhat related note, I wonder if anyone's spamming sitelinks. I honestly do appreciate the feedback and the honest criticism. I wouldn’t claim that Google is perfect, but I do think that we try to respond to feedback. For example, at SES San Jose we got some criticism for our stance on paid links while selling “buy PageRank”-type ads. Earlier this week, we disabled ads for a bunch of “buy PageRank”-type ads, and I expect us to do that for more such queries. Is Google perfect? Nope. Do I secretly sometimes fantasize that Larry/Sergey would run a “CEO for a day” contest, I would win it, and I could change several little things about Google that annoy me? Yup, I’ve daydreamed about that more than once. :) But in the mean time, there’s a bunch of Googlers who try to do the right thing and try to make sure that Google does the right thing. That may be hard to believe, but in my opinion it’s true. Richard Ball, if you’re going to be at PubCon too, please introduce yourself. I enjoy chatting about this more. Is Matt Cutts Honestly Clueless? @graywolf - Hey MG, I don't think you're going to get MC to resolve the Google dichotomy. I honestly don't think he understand that it exists. Remember when AdWords changed color from blue to yellow? Was that to improve search results relevance or blur the line between paid results and organic results? That had nothing to do with anything Matt's team did. They seem to operate in a vacuum, unaware how the business side of Google creates a conflict of interest with what they're attempting to do. MC, if you really want to tackle search engine spam, coerce the AdWords team to display the parked domains from the AdSense for Domains program in reports. For a company whose mission is to organize the world's information, those selective omission of that crucial information undermines your work. Think about that. you'll notice this section: "The report also provides a new level of transparency for traffic you accrued from sites in our network that are participating in the AdSense for domains program. Currently, AdSense for domains statistics are collectively reported, but we are working to give you site-by-site level statistics soon." refers to the site exclusion tool which "can be used to prevent ads from appearing on certain Google content network websites that advertisers don't feel are appropriate for their ads. Advertisers can get an idea of where their ads are showing by running a Placement Performance report." Umm, how can you block individual sites when they're lumped together into a single "Domain Ads" category? Yes, I know an AdSense for Domains opt out exists. That's not what advertisers or domainers need. Advertisers need to actually be able to see where their ads run and pick and choose individual domains to block. Now, can you see why people are having a hard time listening to you talk about paid links and transparency? Good luck. Seriously. Others at Google who aren't as honest and open as your are going to make it difficult for you to be trusted. Will be curious to see a response from either Matt Cutts or Michael Gray. This is a complex situation. There are no simple answers. I do think this Google dichotomy exists. If so, can it be resolved?